Men with cattle at wells dug in a dry river bed, with some cattle drinking from the pools. 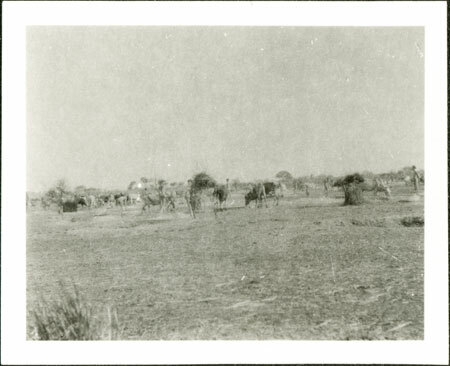 It is possible that the location is somewhere on the Nyanding River where the Nuer Lou frequently made use of such wells during the dry season, and where Evans-Pritchard carried out a short period of fieldwork in 1931. Note on print reverse ms pencil - "4 131 "
Morton, Chris. "Nuer wells" Southern Sudan Project (in development). 03 Jan. 2006. Pitt Rivers Museum. <http://southernsudan.prm.ox.ac.uk/details/1998.346.131.2/>.